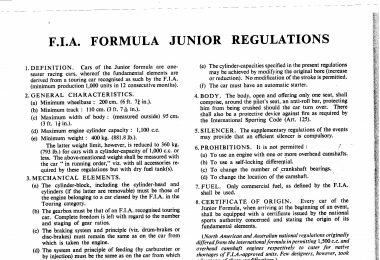 All Formula Junior competitors are reminded that the permitted fuels in Formula Junior races are clearly published in our FJHRA rules [ FJHRA Technical Regulation (6.7.17)]. Higher octane levels permits higher compression ratios to be run without problems. 3.6.2 Except for what concerns non-homologated cars referred to under 3.6.3, fuel for non-homologated Cars must comply with current Appendix J Article 275.16. The fuel must be commercial petrol which is available from service stations and must contain no additive other than that of a lubricant on current sale. The fuel must have the following characteristics: – 102RON/90MON maximum; 95RON/85MON minimum for unleaded fuels and 100RON/92MON maximum; 97RON/86MON minimum for leaded fuels”. The Scrutineers at UK Championship, FIA Lurani, and Goodwood races may carry out random tests during the year to ensure compliance. 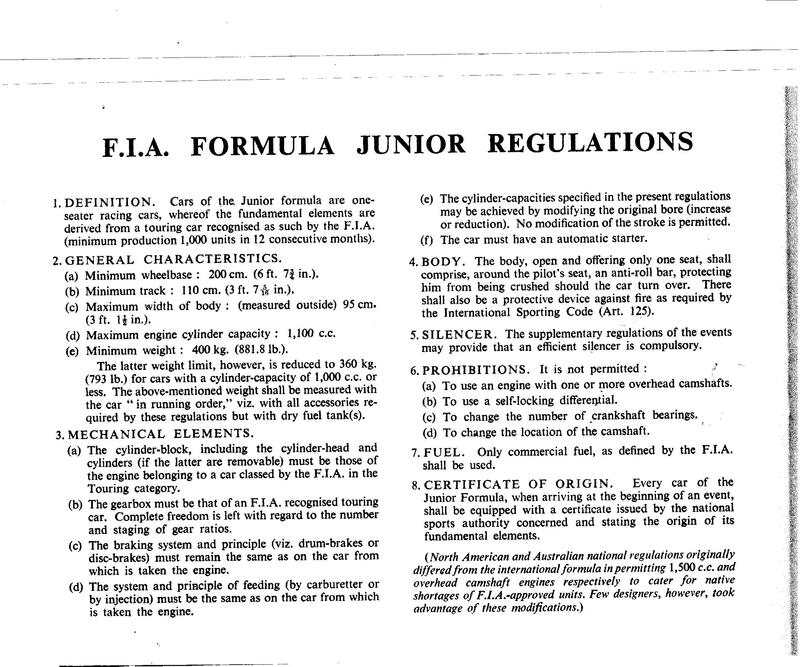 Following a meeting with FIA HMSC Chairman, John Hughes, the FIA expressed a wish to preserve the original 1000cc engines that prevailed in Formula Junior, and to support the moves by FJHRA to encourage front engined cars, Lotus 18s and Cooper T 52s in particular, to retain their original spec motors. As an aside, this will of course put less pressure on the original Renault and Citroen/ERSA gearboxes. Accordingly, from 1st January 2011, in the “Millers Oils” FJHRA/HSCC Formula Junior Championship, and from 1st January 2012 in the FIA Lurani Trophy, there are new classes B1, C1 and D1 in Formula Junior for 1000cc FJ cars which will be treated pari passu for all purposes with existing Classes, and the 1100cc Classes are renamed B2, C2 and D2. At the same time, the disadvantage in points to which Class A and D cars were put, if there were less than 3 runners in a Class, is being removed, and in exchange, with effect from 1st January 2012 in both Championships, where there are less than 4 cars in any Class, the points will be reduced, if 3 qualify to start to 1st-8 pts, 2nd-6pts, and 3rd-4 pts, if 2 qualify to start to 1st-6pts and 2nd-4pts, and if just one starts, then 1st-4pts . Whilst it may sound mildly complicated, it is a fair balance to encourage all the Classes out, without letting a sole Class runner walk away with 10 points every race!! The detail is of course included in the respective FJHRA/HSCC UK and the FIA Lurani Championship regs for 2012. 6.4.32 – Alloy or Titanium valve retainers are not allowed. Material must be magnetic. 6.7.17 – Manifolds can be of Alloy, Steel or Stainless steel and can be of cast of welded construction. 6.7.15.1 – Fuels are as per FIA rules. Basically 100 octane pump fuel plus Lead additive if required.